October 25, 2010  Afghan President Hamid Karzai brushed off news reports that one of his top aides has been receiving bags of cash from Iran. In fact, he says that is normal practice and that he also accepts money from the U.S.
October 22, 2010  The United States has announced another $2 billion in assistance for Pakistan, but warns that it will cut funding for Pakistani military units that kill unarmed prisoners and civilians. 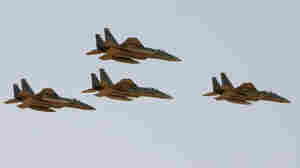 October 20, 2010  The package, which includes F-15 fighter jets and attack helicopters, is part of the U.S. effort to build up allies in the region to counter Iran. Congress has 30 days to block the deal, but a State Department official said he's not expecting much opposition from lawmakers. October 20, 2010  On Wednesday, the State Department announced a large arms sale to Saudi Arabia, including 84 F-15 aircraft, 70 Apache helicopters, 72 Black Hawk helicopters and 36 light attack helicopters. Weapons transfers to Saudi Arabia often provoke strong opposition in the U.S. Congress and in Israel, but the State Department has conferred with both and expresses confidence that the sale will be approved. October 13, 2010  On Wednesday, the secretary of state visited Kosovo, where her husband is considered a hero for stopping an ethnic cleansing campaign in the 1990s. Kosovo's secession from Serbia was ruled legal by the International Court of Justice in July, but Serbian President Boris Tadic has made it clear that the country will not recognize the new nation. October 13, 2010  On Thursday, Secretary of State Hillary Clinton visited Kosovo, where her husband is a hero for stopping an ethnic cleansing campaign in the 1990s. Clinton wants the Serbs and Kosovars to move their relations forward, now that the International Court of Justice has ruled Kosovo's declaration of independence to be legal. But while supporting Kosovo's independence from Serbia, Clinton is also anxious to stress that the Serb minority in Kosovo must be protected. October 12, 2010  Secretary of State Hillary Clinton was in Bosnia on Tuesday, reaching out to Muslim, Serb and Croat politicians, as well as university students, to try to persuade them to put aside their past disputes and prepare the country to eventually join the European Union. With the EU closing off membership, it will be a hard sell to make. But Bosnia desperately needs to reform the constitution that was put in place to end the war -- it achieved that aim, but has since paralyzed the political system. October 12, 2010  Secretary of State Hillary Clinton is in Sarajevo, the capital of ethnically-divided Bosnia-Herzegovina. The country just held elections. Clinton plans to urge the country's new leadership to make EU membership a priority. October 11, 2010  Secretary of State Hillary Clinton leaves Monday for the Balkans, where her husband's administration was deeply involved in ending ethnic conflicts and launching nation-building exercises that are still far from complete. Clinton is to visit Bosnia to nudge the rival ethnic parties to overhaul the constitution. She'll also visit Serbia and Kosovo to encourage them to negotiate now that an international court ruled that Kosovo's independence declaration was legal. 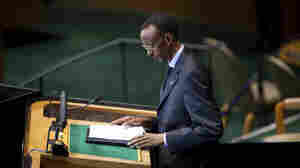 October 1, 2010  The United Nations delayed releasing the report, to give Rwanda a chance to comment on it. The country, which comes out looking the worst, has called it "unacceptable" and an "insult to history." September 30, 2010  The Treasury Department added eight Iranians to a U.S. blacklist because of their role in a crackdown on protesters following last year's disputed election. This is the first time the U.S. is targeting Iranian individuals with sanctions for human rights abuses. September 25, 2010  President Obama wrapped up his three-day visit to the United Nations by trying to avert a new crisis in Africa's largest country. Voters in the southern part of Sudan are expected to vote for independence next year, and the U.S. and its partners are worried that preparations are falling way behind. Secretary of State Hillary Clinton recently called it a time bomb of enormous consequences.